The combination of stand up paddle boarding and yoga has been one of the most innovative workouts of this century, and whether you?re a fan of yoga, boarding or both, there?s no doubt you?ll enjoy it. Stand up paddle boarding yoga has picked up steam in the last couple of years, thanks to the number of benefits it can offer. Before you get started, there are a few key things to remember at all times when you?re out on the board and getting into your poses. Keep these in mind, and you?ll have a better chance at mastering this amazing exercise. Watch the horizon - To keep your balance, choose a spot on the horizon to focus on and you?ll get better stability than if you look down. Mind your mat - The paddleboard?s handle is usually in the center of the board, so use this as your guide and treat the yoga SUP board like a mat to move around this point. Go slow - Although you might be excited to get into it, you should move about half of your regular speed, according to seasoned yogis. Now you know the basics, you?ll need to have the right equipment. There are two main routes you can go down when choosing a paddle board, the specialized SUP yoga boards or a regular SUP. Depending on how much you love this sport and how often you practice, either one will be more suited to your needs. Yoga stand up paddle boards have been designed mainly to support you during poses, so they come with features that make them your very own floating studio. These boards are wide enough to keep your stance, have exceptional stability, and are lightweight enough for travel. However, there?s no need to purchase a specific yoga SUP just to enjoy this exercise. 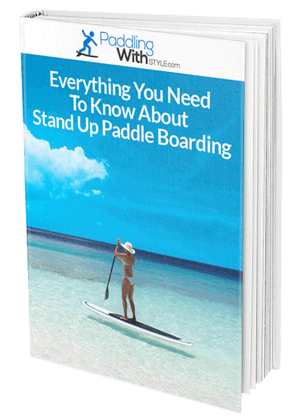 Most styles of stand up paddle boards will already have everything you need to get started. Ensure you?re dressed in comfortable clothing that will allow you the flexibility to move through the poses and there?s nothing else you need. For those wannabe water yogis who can?t get themselves to a class, or just want to brush up a bit on their skills before attending, there are a few simple poses you can try on your first. This is a simple way to get started and is the basis for most other poses. Face the front of your board and sit with your hips on the handle and your hands on your knees. Take deep breaths as you sit up straight, and use this time to balance yourself and find how you move on the board. Begin with the Table Top pose and ensure your navel is positioned above the board?s handle. Move your knees out wider and bring your two big toes together so they are touching. Let your hips sink back into your feet and allow your head to rest on the board in front of you. Your arms can be either draped over the side of the board or extended out in front of you. Moving from Table Top pose, straighten your legs and move your hips up and back to do so. Look backward to the horizon and hold your gaze, taking a few deep breaths as you do and holding the pose. Start from the Downward Facing Dog position and move forward to stack your shoulders above your wrists. Imagine a long line from your crown to your heels and engage your core as you hold it there. For an even harder move, try lifting one leg off the board at a time and holding for a few seconds. Lie prone and place your hands on the board under your ribs. Push your hands into the board and lift your torso up. If you can, engage your quads as well so that you?re able to bring your knees up and away from the board. If you?re still on the fence about trying this famous activity, you might want to take a look at the benefits. Here are some things that you can gain from trying stand up paddle boarding yoga for yourself. A yoga SUP workout routine requires you to engage your core even more as you?re trying to keep balance, so it?s like doing double the workout in half the time. Yoga as a whole is particularly calming, but when you couple it with the tranquility of the water even more so. Add to the fact that a SUP yoga sequence can be a little scary, too, and you?ll have a natural adrenaline rush that can help fight everyday stress. Anyone who?s tried to master stand up paddle boarding before will know that the fall is one of the trickiest parts, so partaking in some SUP yoga is the best way to get practice in and perfect this one skill. Although the look of paddle boarding yoga is enough to scare some people off, it?s really not as difficult as it seems. All you need is some patience, a quality stand up paddle board and water that?s calm enough to allow you to get your balance and find stability. By far the best thing about stand up ? ?paddle boarding yoga is just how much enjoyment it will bring, which can be a key motivator in getting you up and active every day. Whether you love yoga or stand up paddle boarding, or a bit of both, combining the two can give you a workout like you never imagined.